When running a newly install Windows 8 you’ll eventually run into this error. Which is simply a request to install ActiveX. Here it’s Microsoft File Transfer Manager which requires it. There was an error launching File Transfer Manager. If you are running Windows XP with Service Pack 2 or Windows Server 2003 with Service Park 1, this installation may have been blocked. 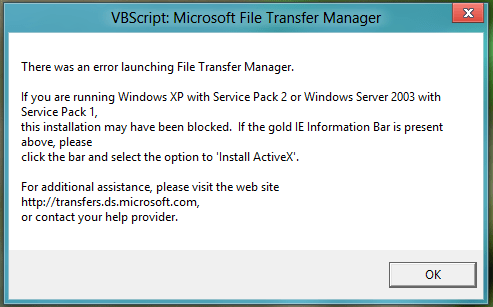 If the gold IE Information Bar is present above, please click the bar and select the option to “Install ActiveX”. For additional assistance, please visit the web site http://transfers.ds.microsoft.com, or contact your help provider. To solve this install ActiveX, press the download and install when it request it.